The Drama starts with Adity and Zoya are in Aditya's room Zoya is ready to run with Aditya and does not want to be arrested. But Police is spread all over Aditya's house, She asks Him how will they able to run? Aditya says I have a plan. Vaseem Sadiqi and His Wife are sitting Waseem are regretted that He is not able to protect His daughters. Noor comes into Riksha and wants to go into Aditya's house, there is police all over the house and they hold Her. She is amazed by this situation and thinks whats wrong here? Noor constantly tries to come in Aditya home. Rajveer listen to Her noise and comes to see what wrong! Arjun also comes to see what is going on. At once Rajveer sees that Aditya and Zoya are run from the house from the roof side He shouts dame Aditya and Zoya stop and runs to stops them. Arjun also sees them and also runs. Noor is still standing at the gate of Aditya's house She does not see Arjun but She sees Zoya and Aditya and thinks worryingly about Zoya. Aditya and Zoya reach His friend Boby's house. He asks Him that They can spend this night at His home? He looks hesitate to answer. He does not call them to inside the house. He looks at His Wife. She needs Her head as no. Aditya says to Him this is Just for Tonight. Tomorrow morning We will go. Boby tells Him that He sees the news. Aditya says He did nothing. I am innocent. It's a trap. Someone want to trap Me. Boby decides to Shelter them. He says come inside the house or Someone can see them. Mahi receives the call from a media person, She says thanks to giving the photos of Aditya and Zoya to Her.Mahi says don't say thanks if You need more pictures of Them She can ask Her.she ends the call then News on TV starts where is telling that Zoya and Aditya have Ran from the house. Mahi says got damn it. How its even happen and pulls Her hairs. one woman asks from Sakshi that Adi's LOVE His wife, what You think that He is the killer of His Wife Pooja? They both are seeing the news. Sakshi says no I know Aditya He cannot do this. Some One wants to trap Him. That Woman goes Sakshi Ji thinks what You are doing Adi? It was better to run you came to me! Maybe I can help You. Aditya and Zoya are sitting inside the Boby's house alone, Zoya says to him what happened it? We are not guilty. Why Someone wants to trape Us? She also says that You saw Mahi? How She can do this to Me? She was My Friend, Why She did this to me? Aditya sees Her with anger and says When You will open Your eyes? She was never Your Friend. She was with You just to grab the insurance money. She was always against You. Zosh's event member is talking about Zoya and Adity. Methilash says that why Rajveer call Us here? Rajveer comes and tells them that its time to choose police or runners. He tries o threaten them by saying that if You guys try to help them I will put You in jail. He says to one policeman to check their mobile phones and asks from them who knows about this that They are not Husband and Wife and just pretend? Everybody is quite. Rajveer comes to Methelash Ji and asks You knew that They are no Husband and Wife? Methlash Ji tries to answer and says no then Rajveer holds His collar and misbehave with Him Shown try to interfere but Rajveer slaps at His face and says give the answer when I will ask You. Ranveer comes out from Zosh's office and Mahi sits on the Rajveer's car taunts Him that what You were said? You are a CBI officer but You constantly fail to catch them, They always one step ahead of You. What are You doing? Rajveer is already in angry mood He also threatens Her to stay away from Him and says They will not be able to go from Mumbai and I will catch them very soon You will see Me then His phone bell rings He picks the call and says I am coming, He is in hurry. Mahi asks Him if They caught? Answer Me got dame! He says with a little smile I want to work alone and goes from there. The Drama starts with Zoya tries to convince Aditya that We have no other choice. We will have to marry. She says that I am going but I know that You will come. I will wait for You. Kalpaysh and Sagarika talk about Zoya and Adity that where they are? Sagarika sees Her and asks Aditya is not coming? Kalpaysh also asks and says I know My Father wants this Marriage to have to happen. I know this is little awkward for Both of You. But you should understand that My Father is an old thought Man. And You guys already Husband and Wife so this little thing should not bother You! Zoya nods and leaves the place. Mahi is seeing at Zoya She is about to go when Rajveer sees Her and pull her arm and says that You said to me that You can do this but I think that You are not able to do so, She answers angerly I told you this is very important to me so you will have to wait and see! Arjun comes to Aditya's room and asks why Zoya came? He says I do not want to talk about it! Arjun says whats wrong with You? you always think about Your self! Aditya says that I have faced a lot of things today I have no Patience to make things right okay! Arjun asks again angerly, Aditya wants to slap Him but hold Himself. His hand is in the air He asks what you want that I slap You? Arjun looks shocked, He says this would remain, Brother, you keep staying awayYour Love ones in your anger and saysYou can share to Me whats wrong whatever You want and leave His room. Mr. Verani asks for that where is Aditya? why He did not come? Mr. Verani Says that why He did not come What He does not want to work with Us? or He is not punctual as He should be? His Son Kalpaysh calm down Him and lie to Him that now He calls Him. He stucks in the traffic jam, and will come as soon as possible. Harsh calls Anjna and says that making sure that Aditya stays at home Anjna says okay I take Your call to Him. She comes to Aditya's room and calls Him, She tries to find Him and call His name but He is not in the room. She tells Harshwardeen that Adi is not at home. Mr.Verani is worrying about there marriage when Rajveer comes and says Him to calm down He will arrive soon! Kalpaysh His little brother and Sagarika is worrying about then Sagarika says that I have a plan We all start dance so Aditya seeks some time to arrive here and Papa Ji will not ask for Him, again and again, Kalpysh says okay. Mahi and Sagarika start the dance. Zoya is in bridle dress and constantly seeing at the main door as She is waiting for Aditya. Aditya comes at the end. He looks lost in thoughts then He sees Zoya every one see Him. Mr. Verani sees Him and says You are not looking punctual now let's go and change so the marriage will start as soon as possible! Aditya comes to Zoya, She holds His hand and says that I know that you face something bad today but to come here I am really thankful to you. Aditya says that this marriage is fake do not be emotional this is our work so take it as work to complete it and go. Mahi sees them from distance with anger and pain and says that happy marriage Zoya and Adi, Aditya. Marriage starts Both looks each other with hesitation they complete all the process as not wanting but they have no choice they start their rounds Aditya and Zoya both continuously think their partners and keeps round after round. They even not realize what is going on around them. Then Pundit says now bride will be at front of the groom. Then They see each other and look like they are lost. Pandit says again. Aditya looks at Zoya and nods, She starts crying and says I cant do this, please.Mr. Verani also asks you are getting late, do what pandit is saying. 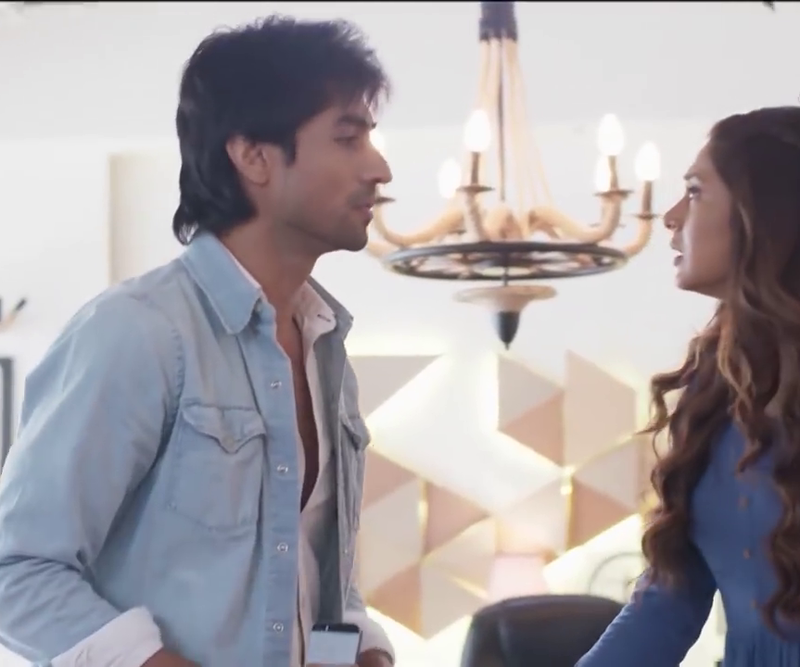 Zoya weepingly comes at front of Him. Rajver says 5 4 3 2 1 boom and then Mr. Verani's House main doors open and Media comes. All cameramen start taking pics and men and women come to them start asking questions and reporting. One woman asks from Zoya, Mam is this true that You and Aditya had a long time LOVE affair and you Both had murdered Your Life Partners? They both look shocked to see Media there. One woman starts reporting and says that look this is the couple. Their Live partners died some days ago and They are getting Married. They are happy.so from it this is clear that they murdered Their partners because of each other. They both try to avoid press but The media surrounds them and asks questions repeatedly.Mr. Verani and Their Sons also seem angry to see media into their house.Mr. Verani looks very angry and asks what You both are not Husband and Wife? You both have separate partners? So how You are getting married to each other? He put His hand on His chest as He is not able to breathe. He also says that that's why I was thinking that Why has he did not say a word to Her? when Zoya and Aditya about to leave the place then Zoya's MIL comes with Mahi and slaps Her. She says that this marriage is fake. Her Mother-In-Law says do not say a word. I know what you will say, You will say that You did all this to save the company but now you can not make me fool I saw You and Him together and that's why He always came to Our house used to be different excuses? I allowed you to stay at My home only because my son loved you and you are also responsible for his death. My son did not cheat on You whether You cheat Him. And He died because of You. I don't want to see Your face again. Zoya sees at Mahi and says that She knows everything She asks from Mahi tell Her Mother that this is not the truth tries to stop Her. She asks from Mahi why you are doing this to me why you do this cheat on me? Mahi says to Her Mother this is Her true personality. She and Her Mother goes. Aditya comes to Zoya and wants to calm down Her. Then Zoya weeps badly and puts Her Face on Aditya's shoulder and hugs Him but after some moments She realized what She is doing, She apart from Him. And says now where will I go? She repeats again and again in shock. Aditya says to Her You will go with Me in My house. He stands up and picks Her and help Her to stand up. Then they both leave the place. Arjun and Anjna see Television where Aditya and Zoya's fake marriage news is telecasting. Anjna and Arjun in shock to see them. Anjna sits with grief and says what Adi is doing? Harsh is drinking and soliloquy Aditya does not make mistake now. Harsh Hooda's servant comes and gives Him tablet to see what is happening. He sees the video of Aditya and Zoya's marriage, He stops the video at Rajveer photo and asks from His servant that Who is this Man ? his servant answers that He is the Person whom We come to meet this the Special police Agent. Harsh says if He is in Mumbai then why He avoided to meet Us and why He is present in this marriage? He instantly calls Anjna and asks what Aditya come home or not She says no He has not come yet. He says that when He came to tell me instantly okay she is about to answer when the main door opens. Aditya and Zoya come home Saksi is on the call with Harsh. He asks that what Aditya come home? Rajveer comes to His home with police and says CBI special investigator officer Rajveer Khana.I come here to caught two Killers I told You before You ask. I come here to caught two KILLERS. The drama starts with Rajveer says to them that Rajveeer says that You both are Under arrest for the murder of Their Husband and Wife now come. He asks lady Police to arrest Zoya. She sees to Aditya. Rajveer tries to wear a hand cough to Aditya but Anjna comes between Aditya and Rajveer and says how You can be caught Him? He is innocent, He is not a murderer, But this Girls(Zoya)is not innocent You should be caught Her, Everything is going to happen just because of Her. Aditya seems anxious and says to His Mother You know nothing, I will tell You what happened but not now. Arjun comes and says that our Servants now about APC conditions how You can come and arrest them have You an arrest warrant? Without warrants, You can not arrest them. Rajveer sees Him arrest warrants, He sees the papers and pull Aditya's arm and says to Him in whispering that these papers are NOT BAILABLE, because of them I can not help You!but I can help Zoya because according to law Pollice cannot arrest a Girl in the night time. Ranveer tells them the storm came in Mumbai and Mysore You guys did not see the news? Neither did he pick the call nor He will be able to come. Mahi report to media with crying in Her house that She did not know about Zoya and Aditya's romance. She even does not know that they have any relation. Some days ago I saw Aditya was coming out from Zoya's room window hiding. He says to Zoya that They have to run to protect There Selves. The Drama starts Aditya says Mahi I never thought of you like that You are my Friend but it does not mean that I LOVE YOU. Mahi feels and looks awkward and says with a painful smile, how stupid am I.How I think about You like this way I do not even know. Aditya says Her please do not break Their friendship and asks what will She not end their friendship. She says no now our friendship is stronger than before. When Mahi return and about to go Zoya comes and asks what happened she says nothing and see her with anger and goes from there. Hursh Hooda meets with a police inspector and asks that who the person want to open this case? He says that you can even take me the phone number or photo of Him. Inspector tells Him that someone from CBI. He says this case must not be opened. He says that I personally see Him. Zoya comes to ADITYA and says that what you are doing with Mahi I told you to stay away from Her but you did not listen to Me. Now You heart Her and broke Her heart. Rajveer pic call from His senior officer and tells Him that He has a lot of evidence to prove this that Pooja's and Yash's death was not an accident that was murder then He sees Mahi. She asks You are a police officer right? Arjun calls Aditya and tells Him that mom and Sakshi are fighting and he can not Handel the situation so He has to come. Saksi is going from home when Aditya comes and says to His Mother that Sakshi Ant will not leave home. It's Her house also. Anjna says to Him ask Her what She is trying to He sees that photo He asks Sakshi that She knows about this? Aditya put Sakshi's bag and try to put it into Her home when bag opens and the Pooja and Yash's photo envelop comes out of the bag Aditya pic that envelops and opens it and asks from Sakshi that you knew about it? Aditya shouts and says yes or no Sakshi says yes I knew Aditya says don't touch me. I trust you before my Mother but You pic Your cheater Daughter. I was amazed that Pooja was cheated on me and how I did not come to know now I have the answer that She had you. you knew that She had a LOVE affair but You did not tell me why. You also cheat on Me. Zoya sits and thinks about how it is possible when Sagarika comes and asks what did she call Her parents? Zoya goes into the flashback in which Her Father says He will never accept Yesh as His Son-in-Law. Her Mother tries to convince Him that Zoya is grown up Girl and right to choose Her life partner, Sagarika asks Her what happened. She answers that Her parents do not like Aditya that's why they have to court marriage. They will never come. Sagarika says its okay We all are here for YOU.